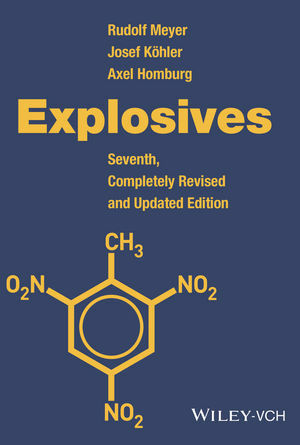 The unrivaled, definitive reference for almost 40 years, this classic work on explosives is now in its seventh, completely revised and updated edition. Some 500 monographic entries, arranged alphabetically, consider the physicochemical properties, production methods, and safe applications of over 120 explosive chemicals. In addition, 70 fuels, additives, and oxidizing agents are discussed as well as the corresponding test methods. Trade, company, and military short names are provided for many of the materials listed, while further key features include a combined index and glossary with terms and abbreviations in English, French, and German, as well as conversion tables and many literature references. Finally, this indispensable source also contains safety data and transport regulations. As founder of the company "Pyrochemie", located in Schardenberg (Austria), Josef Köhler mainly works on the development and production of pyrotechnical special effects for the British film industry. Additionally, he creates new, environmentally friendly priming explosives and works in the field of detonation and ignition technology. Born in Braunschweig (Germany) in 1962, Josef Köhler trained as a pyrotechnician and an authorized user of explosives, completing his degree in chemical engineering in 1988. After completing his basic military service, he began his professional career as an administrator in the R&D department of an explosives company. From 1991 onwards, he worked initially as the assistant to the works manager in producing combustible ammunition, and was promoted to manager two years later. In 1996 he left to found his own company in Austria. As well as being a technical writer, Josef Köhler works as a freelance lecturer and sworn expert for the courts. From 1987 through 1997 Dr. Homburg was chairman of the board at Dynamit Nobel AG, switching to the supervisory board upon his retirement in 1998, where he remained a member until 2002. He was born in 1936 in Hanover (Germany), and studied at the Technische Hochschule in Darmstadt (Germany), where he gained his doctorate in the field of jet engines and rocket technology. From 1963 to 1968 he was a scientific assistant at the TH Darmstadt, before joining the "Propellants" department at Dynamit Nobel AG in 1969. In 1972 he became head of the main R&D department for explosives, the business unit he represented when he joined the board in 1983. Axel Homburg sits on various national and international committees, and has been chairman of the board of trustees at the Fraunhofer Institute for chemical Technology (ICT) since 1994 and a member of the board of trustees at the Federal Institute for Materials Research and Testing (BAM) since 1989. Around 500 alphabetically ordered, monographic entries related to the area of explosives.